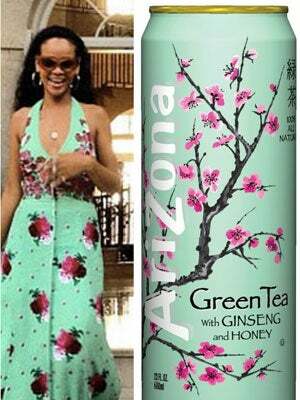 Who Wore It Best: Rihanna Or Arizona Iced Tea? Guys, iced tea is so hot right now. Not literally, of course. But it's pretty much the most fashionable kind of tea, so it's no surprise that all the celebs are totally trying to copy its style. So rude! Rihanna was just another copycat during her controversial interview with Oprah on Sunday, sporting a maxi-dress that Ms. Green T had worn just days earlier. The photos are, obviously, rocking the boat down in Lala Land (and sparking numerous catfights). Coincidence? We think not. Maybe RiRi's in a secret subliminal advertising deal with Arizona Iced Tea. Actually, we're kind of thirsty, now that you mention it. So, once you get over the scandal, tell us: Who wore it best?